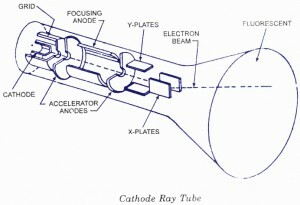 Cathode ray tube essentially consists of an electron gun for producing a stream of electrons, focusing and accelerating anodes for producing a narrow and sharply focused electron beam, horizontal and vertical deflection plates for controlling the beam path and an evacuated glass envelope with phosphorescent screen giving bright spot when struck by a high velocity electron beam. A cutaway view of an early CRT is shown in figure. The electron gun assembly consists of an indirectly heated cathode, a control grid surrounding the cathode, a focusing anode and an accelÂ­erating anode. The sole function of the electron gun assembly is to provide a focused electron beam which is accelerated towards the phosphor screen. 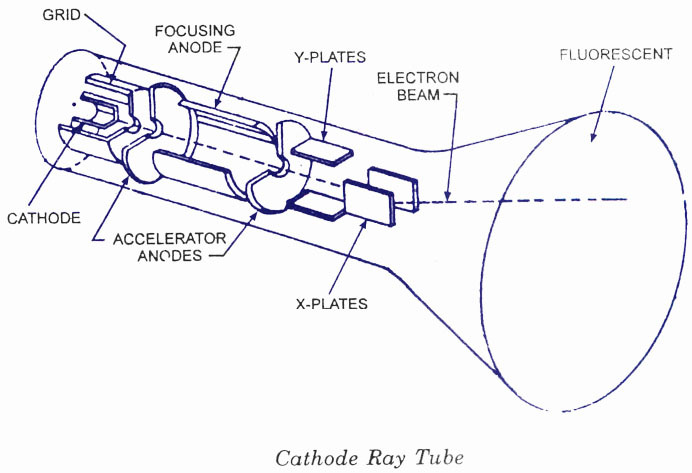 The cathode is a nickel cylinder coated with an oxide coating and emits plenty of electrons, when heated. The emitting surface of the cathode should be as small as possible, theoretically a point. Rate of emission of electrons or say the intensity of electron beam depends on the cathode current, which can be controlled by the control grid |n a manner similar to a conventional vacuum tube. The control grid is a metal cylinder covered at one end but with a small hole in the cover. The grid is kept at negative potential (variable) with respect to cathode and its function is to vary the electron emission and so the brilliancy of the spot on the phosphor screen. The hole in the grid is provided to allow passage for electrons through it and concentrate the beam of electrons along the axis of tube. Electron beam comes outÂ from the control grid through a small hole in it and enters a pre-accelerating anode, which is a hollow cylinder in shape and is at a potential of few hundred volts more positive than the cathode so as to accelerate the electron beam in the electric field. This accelerated beam would be scattered now because of variations in energy and would produce a broad ill-defined spot on the screen. This electron beam is focused on the screen by an electrostatic lens consisting of two more cylindrical anodes called the focusing anode and accelerating anode apart from the pre-accelerating anode. The focusing and accelerating anodes may be open or close at both ends and if covered, holes must be provided in the anode cover for the passage of electrons. The function of these anodes is to concentrate and focus the beam on the screen and also to accelerate the speed of electrons. An electrostatic focusing system is shown in figure. Electrostatic lens consists of three anodes, with the middle anode at a lower potential than the other two electrodes. 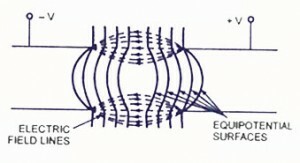 In figure two anodes and its electrostatic lines and equipotential surfaces are shown. A pd is kept between these two electrodes so that an electric field is generated between them. Spreading of electric field is caused because of repulsion between electric lines. If equipotential lines are drawn, as shown in figure, they would bulge at the centre of the two anodes. As we know that electrons move in a direction opposite to that of electric field lines and equipotential surfaces are perpendicular to the electric field lines so force on the electron is exerted in the direction normal to the equipotential surface. Electrons entering at the centre line of the two anodes experience no force but electrons displaced from the centre line experience a force normal to the direction of equipotential surface and deflect, as shown in figure. An equi potential surface is shown, in which an electron with velocity V1 and at an angle Î¸. to the normal of equipotential surface enters and experiences a force in a direction normal to the equipotential surface. Thus the velocity of the electron increases to V2. This force on the electron is exerted in the direction normal to equipotential surface so only the normal component of electron velocity V1N increases to V2N and the tangential component of velocity V1T remains the same. From the above expression it is obvious that equipotential surface acts as a concaveÂ lens in geometrical optics. That is why, this focusing system is named as an electrostaticÂ lens. 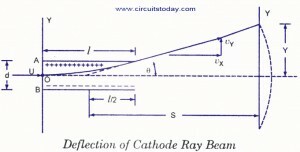 Now if we go back and refer figure, it can be seen that because of middle anodeÂ to a lower potential, electron beam coming from the cathode and passing through the first concave electrostatic lens tends to become more aligned with the axis of CRT and when it enters at the second concave electrostatic lens, formed between two anodes at different potentials, it is focused at the phosphor screen. Focal length of the electrostatic lens can lie adjusted by varying potential of middle anode with respect to other two anodes. Thus electron beam can be made to focus at the screen very precisely. 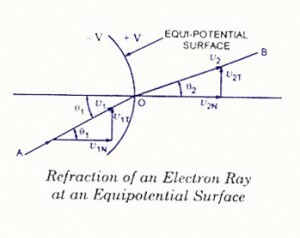 Electron beam, after leaving the electron gun, passes through the two pairs of deflection pates. One pair of deflection plates is mounted verÂ­tically and deflects the beam in horizontal or X-direction and so called the horizontal or l-plates and the other pair is mounted horizontally and deflects the beam in vertical or Y-direction and called the vertical or Y-plates. These plates are to deflect the beam according to the voltage applied across them. For example if a constant pd is applied to the set of Y-plates, the electron beam will be deflected upward if the upper plate is positive. In case the lower plate is positive then the beam will be deflected downward. Similarly if a constant pd is applied to the set of X-plates, the electron beam will be deflected to the left or right of the tube axis according to the condition whether the left or right plate is positive. When a sinusoidal voltage is applied to Y-plates, the beam will be moved up and down according to the variation of plate potential. If the frequency of variation is more than 16 Hz the deflection will be a vertical line in the centre of the screen. In case the sinusoidal voltage is applied to X-plates and frequency of variation is more than 16 Hz the deflection will be a horizontal line. If potentials are applied to both sets of plates simulÂ­taneously, the deflection will be an oblique line. The amount of deflection is in proportion to the voltage applied to the pair of plates. Deflection of Moving Electrons in CRO Tubes. We know that a force is experienced by an electron when it is kept in a uniform electric field. This principle is the basis for the deflection of electron beam owing to deflection plates.Â Let us consider an electron having initial velocity of u m/s along X-axis at point O in the space between the plates A and B, each of length l metres and separated by a distance of d metres. Let the pd across the plates be of V volts. For simplicity, let us assume that the field is uniform and does not extend beyond the ends of the plates.Â Axial velocity of electron remains unchanged and is equal to u as there is no axial force and, therefore, no axial acceleration. As we know that some crystalline materials, such a phosphor,Â have property of emitting light when exposed to radiation. This is called the fluorescenceÂ characteristic of the materials. These fluorescent materials continue to emit light evenÂ after radiation exposure is cut off. This is called the phosphorescence characteristic of theÂ materials. The length of time during which phosphorescence occurs is called the persistence of the phosphor.The end wall of the CRT, called the screen, is coated with phosphor. When electron beam strikes the CRT screen, a spot of light is produced on the screen. The phosphor absorbs the kinetic energy of the bombarding electrons and emits, energy at a lower frequency in a visual spectrum. Among the fluorescent materials used are zinc orthosilicate giving a green trace very suitable for visual observations; calcium tungstate giving blue and ultra-violet radiations very suitable for photography and zinc sulphide with other materials giving a white light suitable for TV. Zinc phosphate gives a pronounced after glow and is useful when studying transient phenomena because the trace persists for short while after the transient has disappeared. The whole assembly is protected in a conical highlyÂ evacuated glass housing through suitable supports. The inner walls of CRT between neckÂ and screen are usually coated with a conducting material known as aquadag and thisÂ coating is electrically connected to the accelerating anode. The coating is provided inÂ order to accelerate the electron beam after passing between the deflecting plates and toÂ collect the electrons produced by secondary emission when electron beam strikes theÂ screen. Thus the coating prevents the formation of – ve charge on the screen and stateÂ of equilibrium of screen is maintained.Â Horizontal and vertical marks are marked on the screen of the CRT to provide user a correct measurement. These marks, usually in rectangular form, are called graticule. We know that in television cathode ray tubes, a picture on screen is scanned sequentially in lines by a moving electron beam. Nevertheless, two successive lines in a TV picture are interlaced in two different successive voltage sweepings of the vertical chokes. That means, in a vertical sweeping period, there are blanked and unused lines on screen that we can make the most of filling them with video signals. By doing this, we can double the number of pictures per second on screen as an attempt of making High Definition TV. And it will entail solvable technical difficulties. 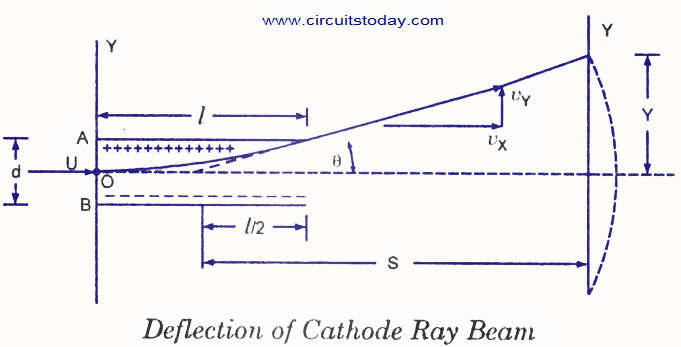 For example, we can double the number of the cathodes from three to six,in a color cathode ray tube,to scan simultaneously two successive lines. There wonâ€™t be much change in the configuration and electrical parameters of the vertical and horizontal deflection chokes. The spectrum bandwidth required would be doubled perhaps, and the amplitude of video signal luminance must be reduced by half, etc. Please note that in amplitude modulation, if the video signal amplitude is reduced by half, we can find ways to reduce the bandwidth required accordingly. There, of course, are other technical problems, but I believe that engineers can solve them without the need of developing new costly techniques. In cathode ray tubes, we probably find it extremely hard, if not impossible, to light up all light dots simultaneously per picture on screen. Why donâ€™t we think of a combination of cathode ray tube and LCD or plasma techniques on a screen? This may be an adventure for technical wizards. HOW IS THE BEAM OF ELECTRONS FOCUSED ONTO THE DISPLAY OF AN OSCILLOSCOPE SCEEN?